You might recall that the Xbox One X console was once known as "Project Scorpio" while in development, and Microsoft has paid homage to that legacy with a little surprise hidden inside each unit. 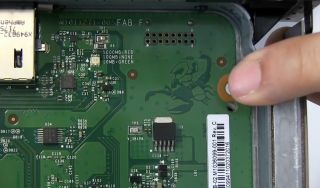 Specifically, it's a little drawing of Master Chief from Microsoft's acclaimed Halo series riding a scorpion that's etched directly into the circuit board. It also makes for a humorous visual pun that references "Scorpion" tanks the Chief sometimes drives. You normally won't see it unless you tear apart your unit (and thus void your warranty, among other things), but YouTuber Unocero valiantly took that step for us all and revealed his discovery in a recent video. You can see it at around the 11:10 mark. This is not the first time Microsoft has done something like this, as last year's Xbox One S also contained a little etching of Master Chief. Here's a video from YouTuber Austin Evans showing where you'll find it. Alas, the Xbox One S version has no scorpions or similar in-jokes. In both cases, the character looks a little like Capcom's Mega Man owing to the stylized image. Not enough scorpions for you? The Project Scorpio name will live on in the limited-edition Project Scorpio Edition of the Xbox One X, which is essentially the same console but with a special design elements on the console and gamepad. It's already sold out at many retailers. Microsoft calls the Xbox One X "the world's most powerful console" almost every chance it gets, and not without reason. It boasts 6 TFLOPS of computing performance, which puts it significantly ahead of the competing PS4 Pro's 4.2 teraflops. In addition, its impressive 12GB GDDR5 graphics card natively supports 4K resolution. The Xbox One X will launch on November 7 and sell for $499 / £449 / AU$$649.